On the morning of Saturday, March 19th, Pacific Ridge 8th-grade Conceptual Physics students successfully sent a weather balloon 95,000 feet into the atmosphere! 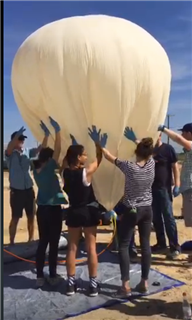 A group of students, faculty and parents launched the balloon near the Salton Sea and retrieved it from agricultural land in the Imperial Valley, while members of the Pacific Ridge community tracked the balloon's 40 mile journey via livestream and a real-time map powered by a GPS on the balloon's payload. Stay tuned for more information about how the project came together and what conclusions can be made from the students' onboard experiments. In the meantime, click here to enjoy a video from the launch.